An inductor, also called a coil, choke, or reactor, is a passive two-terminal electrical component that stores energy in a magnetic field when electric current flows through it. An inductor typically consists of an insulated wire wound into a coil around a core.
. The negative sign indicates that the work is done against the emf, and is not done by the emf. At low frequencies and within limits, increasing the number of turns N improves Q because L varies as N2 while R varies linearly with N. Similarly increasing the radius r of an inductor improves (or increases) Q because L varies as r2 while R varies linearly with r. So high Q air core inductors often have large diameters and many turns. Both of those examples assume the diameter of the wire stays the same, so both examples use proportionally more wire. If the total mass of wire is held constant, then there would be no advantage to increasing the number of turns or the radius of the turns because the wire would have to be proportionally thinner. Two (or more) inductors in proximity that have coupled magnetic flux (mutual inductance) form a transformer, which is a fundamental component of every electric utility power grid. The efficiency of a transformer may decrease as the frequency increases due to eddy currents in the core material and skin effect on the windings. The size of the core can be decreased at higher frequencies. For this reason, aircraft use 400 hertz alternating current rather than the usual 50 or 60 hertz, allowing a great saving in weight from the use of smaller transformers. Transformers enable switched-mode power supplies that isolate the output from the input. 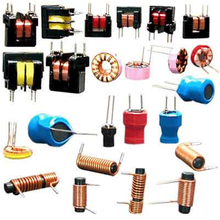 An inductor usually consists of a coil of conducting material, typically insulated copper wire, wrapped around a core either of plastic (to create an air-core inductor) or of a ferromagnetic (or ferrimagnetic) material; the latter is called an "iron core" inductor. The high permeability of the ferromagnetic core increases the magnetic field and confines it closely to the inductor, thereby increasing the inductance. Low frequency inductors are constructed like transformers, with cores of electrical steel laminated to prevent eddy currents. 'Soft' ferrites are widely used for cores above audio frequencies, since they do not cause the large energy losses at high frequencies that ordinary iron alloys do. Inductors come in many shapes. Some inductors have an adjustable core, which enables changing of the inductance. Inductors used to block very high frequencies are sometimes made by stringing a ferrite bead on a wire. Small inductors can be etched directly onto a printed circuit board by laying out the trace in a spiral pattern. Some such planar inductors use a planar core. Small value inductors can also be built on integrated circuits using the same processes that are used to make interconnects. Aluminium interconnect is typically used, laid out in a spiral coil pattern. However, the small dimensions limit the inductance, and it is far more common to use a circuit called a gyrator that uses a capacitor and active components to behave similarly to an inductor. Regardless of the design, because of the low inductances and low power dissipation on-die inductors allow, they're currently only commercially used for high frequency RF circuits. should be roughly ​1⁄10 wavelength or smaller. ^ Nagaoka’s coefficient (K) is approximately 1 for a coil which is much longer than its diameter and is tightly wound using small gauge wire (so that it approximates a current sheet). ^ Alexander, Charles; Sadiku, Matthew. Fundamentals of Electric Circuits (3 ed.). McGraw-Hill. p. 211. ^ Singh, Yaduvir (2011). Electro Magnetic Field Theory. Pearson Education India. p. 65. ISBN 978-8131760611. ^ Wadhwa, C. L. (2005). Electrical Power Systems. New Age International. p. 18. ISBN 978-8122417227. ^ Pelcovits, Robert A.; Josh Farkas (2007). Barron's AP Physics C. Barron's Educational Series. p. 646. ISBN 978-0764137105. ^ a b c Purcell, Edward M.; David J. Morin (2013). Electricity and Magnetism. Cambridge Univ. Press. p. 364. ISBN 978-1107014022. ^ Shamos, Morris H. (2012-10-16). Great Experiments in Physics: Firsthand Accounts from Galileo to Einstein. Courier Corporation. ISBN 9780486139623. ^ Schmitt, Ron (2002). Electromagnetics Explained: A Handbook for Wireless/ RF, EMC, and High-Speed Electronics. Elsevier. pp. 75–77. ISBN 978-0080505237. ^ Jaffe, Robert L.; Taylor, Washington (2018). The Physics of Energy. Cambridge Univ. Press. p. 51. ISBN 978-1108547895. ^ Lerner, Lawrence S. (1997). Physics for Scientists and Engineers, Vol. 2. Jones and Bartlet Learning. p. 856. ISBN 978-0763704605. ^ Bowick, Christopher (2011). RF Circuit Design, 2nd Ed. Newnes. pp. 7–8. ISBN 978-0080553429. ^ Kaiser, Kenneth L. (2004). Electromagnetic Compatibility Handbook. CRC Press. pp. 6.4–6.5. ISBN 978-0849320873. ^ "Aircraft electrical systems". Wonderquest.com. Retrieved 2010-09-24. ^ Ott, Henry W. (2011). Electromagnetic Compatibility Engineering. John Wiley and Sons. p. 203. ISBN 978-1118210659. ^ Violette, Norman (2013). Electromagnetic Compatibility Handbook. Springer. pp. 515–516. ISBN 978-9401771443. ^ "An Unassuming Antenna – The Ferrite Loopstick". Radio Time Traveller. January 23, 2011. Retrieved March 5, 2014. ^ Frost, Phil (December 23, 2013). "What's an appropriate core material for a loopstick antenna?". Amateur Radio beta. Stack Exchange, Inc. Retrieved March 5, 2014. ^ Poisel, Richard (2011). Antenna Systems and Electronic Warfare Applications. Artech House. p. 280. ISBN 978-1608074846. ^ Yadava, R. L. (2011). Antenna and Wave Propagation. PHI Learning Pvt. Ltd. p. 261. ISBN 978-8120342910. ^ "Inductors 101" (PDF). vishay. Retrieved 2010-09-24. ^ "Inductor and Magnetic Product Terminology" (PDF). Vishay Dale. Retrieved 2012-09-24. ^ http://www.coilcraft.com/pdfs/uni5.pdf Coilcraft catalog page with aluminum cores. Accessed 10 July 2015. ^ a b Nagaoka, Hantaro (1909-05-06). "The Inductance Coefficients of Solenoids" (PDF). 27. Journal of the College of Science, Imperial University, Tokyo, Japan: 18. Retrieved 2011-11-10. ^ Kenneth L. Kaiser, Electromagnetic Compatibility Handbook, p. 30.64, CRC Press, 2004 ISBN 0849320879. ^ Terman 1943, pp. 48–49, convert to natural logarithms and inches to mm. ^ Terman (1943, p. 48) states for ℓ < 100 d, include d/2ℓ within the parentheses. ^ Burger, O. & Dvorský, M. (2015). Magnetic Loop Antenna. Ostrava, Czech Republic: EDUCA TV o.p.s. up to ​1⁄3 wavelength are feasible antennas, but for windings that long, this formula will be inaccurate. ^ ARRL Handbook, 66th Ed. American Radio Relay League (1989). ^ Wheeler, H.A. (October 1928). "Simple Inductance Formulas for Radio Coils". Proceedings of the Institute of Radio Engineers. 16 (10): 1398. Retrieved 22 June 2015. ^ For the second formula, Terman 1943, p. 58 which cites to Wheeler 1928. ^ "A Magnetic Elevator for Neutral Atoms into a 2D State-dependent Optical Lattice Experiment". Uni-Bonn. Retrieved 2017-08-15.